Posted Dec 31, 2017 by Eds. Why it matters: Given that wage theft disproportionately affects workers from low-income households—who are already struggling to make ends meet—the loss of wages can be devastating. And these recovery numbers likely dramatically underrepresent the pervasiveness of wage theft—it has been estimated that low-wage workers lose more than $50 billion annually to wage theft. Regardless of what share of actual wage theft the recovery numbers represent, these data are one more reminder that wage theft is not isolated to a few bad employers, but affects workers much more broadly. What can be done about it: Implement legislation to improve pay transparency; increase penalties for wage theft violations; support strong government enforcement of wage and hour laws; protect workers from retaliation when they report violations; and protect worker rights to collective and class action. The last four decades have been marked by rising wage inequality, with the vast majority of American workers experiencing wage stagnation while those at the top rung of the economic ladder reap the benefits of growth in productivity. These dynamics mean that many workers struggle to make ends meet; in 2016 one in five families in which at least one person worked were living below 200 percent of the federal poverty line (U.S. Census Bureau 2017).1 This situation is deeply exacerbated by wage theft, which continues to rob workers of billions of dollars in earned pay each year, with low-income workers being disproportionately affected (Bernhardt et al. 2009). Wage theft occurs when employers fail to pay workers the full wages to which they are entitled for their labor. This includes, for example, refusing to pay workers the total amount of promised wages, not paying for time spent preparing a workstation at the start of a shift or closing up at the end of a shift, and not paying overtime premiums to workers who work more than 40 hours a week. Consider a full-time minimum wage worker earning the federal minimum wage of $7.25 an hour, around $15,000 per year. If this worker’s employer asks her to work 15 minutes “off the clock” before and after her 8-hour shift each day, that extra half hour of unpaid work each day represents a loss to the worker (and a gain to the employer) of around $1,400 per year, including the overtime premiums she should have been paid. This constitutes theft of nearly 10 percent of a minimum wage employee’s annual earnings—which can mean the difference between paying the rent and utilities or risking eviction or the loss of gas, water, or electric service. A recent EPI study (Cooper and Kroeger 2017) found that one particular form of wage theft, paying workers less than the minimum wage, impacts around 17 percent of low-wage workers in the 10 most populous states (California, Florida, Georgia, Illinois, Michigan, New York, North Carolina, Ohio, Pennsylvania, and Texas) and costs workers in those states around $8 billion per year. Should these findings hold true nationally, it is reasonable to assume that minimum wage violations alone are costing workers at least $15 billion per year. This means that stolen wages represent far more than FBI estimates of the total annual value of all robberies, burglaries, larceny, and motor vehicle theft in the United States, at $12.7 billion (Cooper and Kroeger 2017). 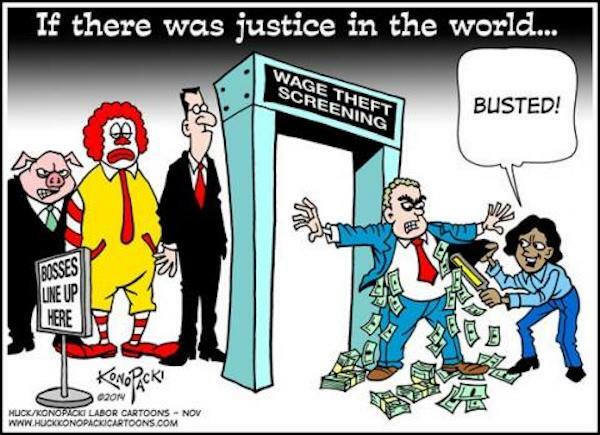 If the overall cost of wage theft is staggering, so are the costs to individual workers. Cooper and Kroeger (2017) find that workers suffering minimum wage violations are cheated out of $64 a week—$3,300 annually for year-round workers. These workers lose almost one-quarter of their earnings, receiving on average only $10,500 in annual wages instead of the $13,800 they should have received. Furthermore, Cooper and Kroeger find that while minimum wage violations affect workers broadly across demographic categories, disproportionate shares of wage theft victims are people of color, women, immigrants, young people, workers from modest-income households, nonunionized workers, and workers who have do not have a bachelor’s degree. Most workers whose wages are stolen do not report the violation. When workers do report wage theft, state departments of labor and attorneys general often lack adequate enforcement resources. Fourteen states, most of which use the federal minimum wage, either lack the capacity to investigate wage theft claims or lack the ability to file lawsuits on behalf of victims (Galvin 2016).6 These states effectively defer to the federal government for enforcement. In 2016, the U.S. Department of Labor Wage and Hour Division, responsible for enforcing wage and hour laws, had around 1,000 investigators responsible for 7.3 million workplaces (U.S. DOL 2017). Given this, the probability of any specific workplace being investigated for wage theft in a given year is minuscule. In this study, we seek to contribute to the knowledge base on wage theft by collecting and aggregating available data on recovery of stolen wages in the United States. In order to get as comprehensive a picture as possible of wage recovery across the United States, we reviewed current U.S. Department of Labor wage enforcement data, surveyed state labor departments and attorneys general, and mined data from a report on private civil litigation class action settlements. U.S. DOL recovered $246.8 million from wage and hour violators in 2015 and $266.6 million in 2016, for a total of $513.3 million over both years (WHD 2017).7 See Appendix Table A1. State departments of labor and attorneys general in 39 states recovered $170.0 million in 2015 and $147.5 million in 2016, for a total of $317.5 million over both years.8 See Appendix Table A2 for a breakdown by state. The top 10 wage and hour class action settlements in 2015 totaled $463.6 million; in 2016, they totaled $695.5 million, for a total of $1.2 billion over both years (Seyfarth Shaw LLP 2017). 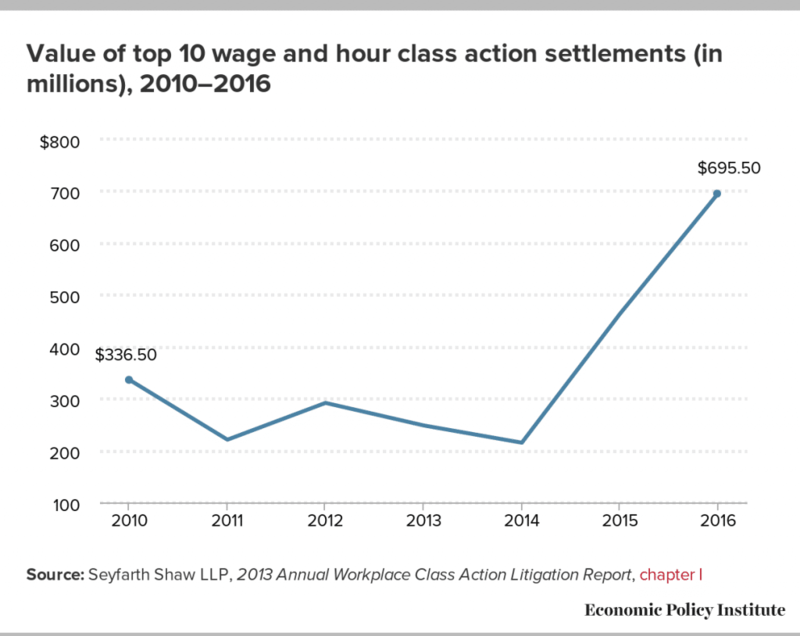 The value of the top 10 wage and hour class action settlements has risen dramatically in recent years (see Figure A); the 2016 wage and hour class action settlements figure is the largest in the last decade (Seyfarth Shaw LLP 2017, 9). The growth in private litigation of these cases is indicative both of the extent of the wage theft problem and of the inadequacy of enforcement resources at the government level. Altogether, amounts recovered by U.S. DOL, by states, and through class action settlements totaled $880.3 million in 2015 and $1.1 billion in 2016, for a total of $2 billion over both years. It is important to note that these data do not represent the amount of wages stolen from workers each year. In fact, U.S. DOL and state recovery figures likely dramatically underrepresent the problem of wage theft, since probably only a fraction of victims actually file complaints with the government. Similarly, only a fraction of victims are involved in class action settlements. Raising the cost to employers for violating the law. Research demonstrates that meaningful penalties can have a deterrent effect on wage theft. Lawmakers should enact triple-damages laws that require an employer who has violated the law to pay a worker three times the amount of wages owed. Improving transparency. Many workers do not receive information from their employers about the basic terms and conditions of their employment. This lack of transparency makes it difficult for workers to establish that they are not being paid fairly. Lawmakers should ensure that every worker gets a statement of pay that shows rate of pay, hours worked, and deductions from pay. Supporting strong government enforcement. The U.S. Department of Labor and state agencies tasked with enforcing wage and hour protections must be given adequate resources to enforce the law. Protecting workers from retaliation. A national survey found that 43 percent of workers who complained to their employer about their wages or working conditions experienced retaliation (Bernhardt et al. 2009). This has a chilling effect on the entire workplace, which leaves all workers more vulnerable. Meaningful penalties for retaliation would be an effective way to deter employers from retaliating and to compensate workers who experience retaliation. Enabling enforcement agencies to receive anonymous worker complains or permitting third parties (such as unions or worker centers) to file complaints on behalf of workers also limits employer retaliation. Wage theft is devastating to the workers whose wages are stolen and to their families. Victims of wage theft largely represent low-income households—who need every dollar they earn to pay for basics like rent, utilities, and groceries. To protect these workers’ rights to be paid the wages they have worked hard for, lawmakers must act to ensure that employers are held responsible for abiding by wage and hour laws and paying workers the wages they are owed. 3. Total earnings of $17,616 are the earnings these workers should have received. They actually received $17,616 – $2634 = $14,982. 5. Generalizing these results from 2008 to the 2016 nationwide workforce in low-wage industries requires a few adjustments. First, the three-city low-wage workforce in Bernhardt et al.’s (2009) study represented 15.1 percent of all workers in those cities, so scaling up to the national level requires multiplying by 14.3, the ratio of the size of 15.1 percent of the national workforce relative to the size of 15.1 percent of the three-city workforce. (For the size of the national workforce, we use counts of all wage earners from the Social Security Administration [SSA 2017] as the measure of employment.) Second, wage theft will have increased because nominal wages have grown (16.6 percent at the 10th percentile) and overall employment has grown (5.2 percent) between 2008 and 2016. (Low-wage workers in Bernhardt et al.’s study had a median wage of roughly $8.00, which corresponds to the 10th percentile wage in 2008; the nominal increase in the 10th percentile wage from 2008 to 2016 was 16.6 percent [EPI 2017]. According to the SSA employment counts [SSA 2017], overall employment grew 5.2 percent.) These adjustments yield an estimate of $52 billion a year that workers lost to all forms of wage theft in 2016. 6. Data are provided in an Excel spreadsheet attached to Galvin 2016, which is downloadable online. 7. Totals are computed using unrounded numbers. Data may not sum to totals due to rounding. 8. State-level data for this survey were collected by contacting state departments of labor and attorneys general and requesting data on recovered wages. We collected data from 39 states; for 11 other states, we either did not receive a response to our request or the states do not track the requested data. These data are available upon request. 9. The Supreme Court is currently considering whether workers can be required to waive their right to pursue work-related claims on a class action basis. The National Labor Relations Board has found that forced arbitration agreements that interfere with workers’ right to act together to improve their wages and working conditions violate the National Labor Relations Act. If the Court reaches a different conclusion, workers may lose the ability to pursue workplace disputes as class actions. Workers depend on class actions to enforce workplace rights and the class action settlement data makes it clear that class actions are fundamental to the enforcement of wage and hour standards. See McNicholas 2017. Bernhardt, Annette, et al. 2009. Broken Laws, Unprotected Workers: Violations of Employment and Labor Laws in America’s Cities, 2009. Center for Urban Economic Development, National Employment Law Project, and UCLA Institute for Research on Labor and Employment. Bureau of Labor Statistics (BLS). 2017. “Table 3. Employees on Nonfarm Payrolls by State and Selected Industry Sector, Seasonally Adjusted.” Local Area Unemployment Statistics (LAUS). Last modified November 17, 2017. Accessed December 8, 2017, at https://www.bls.gov/news.release/laus.t03.htm. Cooper, Dave, and Teresa Kroeger. 2017. Employers Steal Billions from Workers’ Paychecks Each Year: Survey Data Show Millions of Workers Are Paid Less Than the Minimum Wage, at Significant Cost to Taxpayers and State Economies. Economic Policy Institute, May 10. Economic Policy Institute (EPI). 2017. “Wages by Percentile” [data set]. In State of Working America Data Library. Accessed December 8, 2017, at www.epi.org/data/. Galvin, Daniel. 2016. Supplementary materials for “Deterring Wage Theft: Alt-Labor, State Politics, and the Policy Determinants of Minimum Wage Compliance.” Perspectives on Politics vol. 14, no. 2. Seyfarth Shaw LLP. 2017. “Chapter I. Overview of the Year in Workplace Class Action Litigation.” In 13th Annual Workplace Class Action Litigation Report. Social Security Association (SSA). 2017. “Wage Statistics for 2008” and “Wage Statistics for 2016.” Data tables accessed December 7, 2017, at www.ssa.gov/cgi-bin/netcomp.cgi. U.S. Census Bureau. 2017. “2017 CPS Poverty Table: POV06. Families by Number of Working Family Members and Family Structure. Poverty Status in 2016. Below 200 Percent of Poverty. All Races” [XLS file]. Current Population Survey, 2017 Annual Social and Economic Supplement. U.S. Department of Labor (U.S. DOL). 2017. Working for You: U.S. Department of Labor, 2009–2016. Wage and Hour Division (WHD). 2017. “WHD: All Acts” [data table]. Fiscal Year Data for WHD. U.S. Department of Labor. Accessed December 5, 2017.